According to The Economist and the International Monetary Fund (IMF), global housing markets have been on a slow but steady rise worldwide since the dip of the 2008-2009 financial crisis. Out of 26 countries that hold the world’s major housing markets (including Brazil, Japan, the United Kingdom), 19 show rapidly rising prices, to the tune of a 5.2% median increase annually. Housing markets in certain nations in 2014 showed exceptional growth, such as Singapore (around 6%), and Sweden (around 9%), while other global housing markets such as Japan, China, France and Greece all saw a decline in real house prices. However, global averages show less than half of the story. 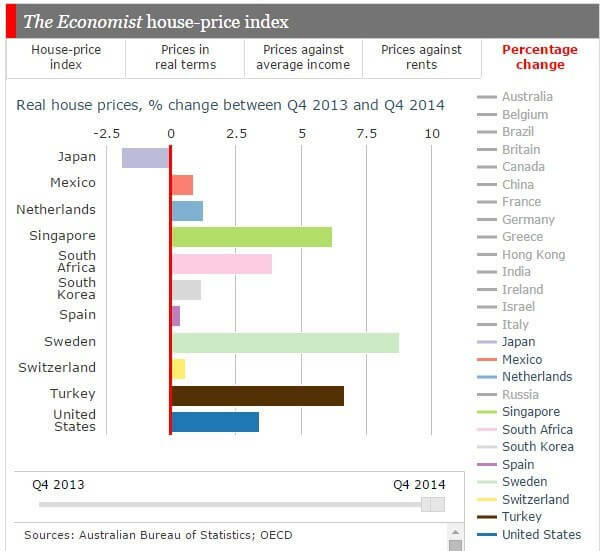 The fact that global housing markets are going up on average does not mean that prices in Spain are following the same trends as those in Ireland or Australia. Sometimes, the number may be beefed up by strong markets in capital cities like London or Sydney, even if other cities only show average performances. One of the main factors in determining household prices is the national interest rate. The lower the interest rates are, the cheaper it is to get a loan and the easier it is to get a house. The reverse is true as well: higher interest rates lowers demand, which lowers prices. Australia illustrates this kind of situation. Housing prices in Melbourne and Sydney jumped to new highs in August, reaching 4.9% and 3.3% growth rates respectively. This growth was caused by the Federal government, lowering interest rates in response to a declining mining industry. 1300HomeLoan reports that this is not likely to change soon. Another market force that acts on global housing markets is the ongoing demand for property, regardless of the current interest rates. Housing in the Ukraine would be a very obvious example. Because of the rock-and-a-hard place situation, the Ukraine is not really a place to plan for retirement, it’s not a very good choice for a vacation at the moment, and renting out units would probably backfire. In other words, demand is low because of the conflict and its circumstances. In Australia, the Melbourne and Sydney markets are taking off by leaps and bounds, prices having increased by 7.6% and 12.4% respectively, in 2014. Outside of those two cities, Adelaide and Brisbane are relatively high, posting growth rates of 4.3% and 4.8% respectively. 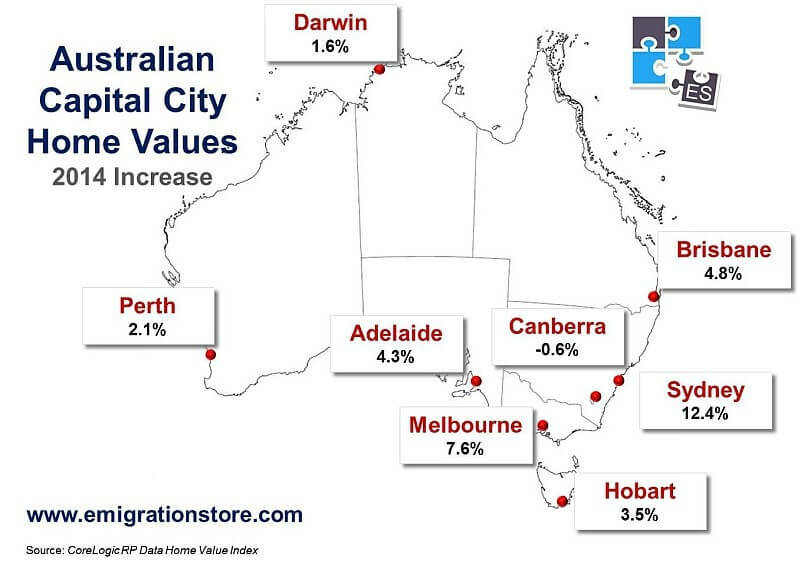 Darwin is far down on the spectrum, with 1.6% growth, and Canberra is negative, at -0.6%. So, as you can see, depending on the area, the price of new property developments or existing properties in Australia can vary significantly. The United Kingdom illustrates this even more drastically. While London posted a price growth of 2.9%, the West Midlands and Wales were at -1.5%, while Scotland and the northern section were both -2.9%. Demand in the capital city is a constant, pushing prices up by a much as 0.8% a month. 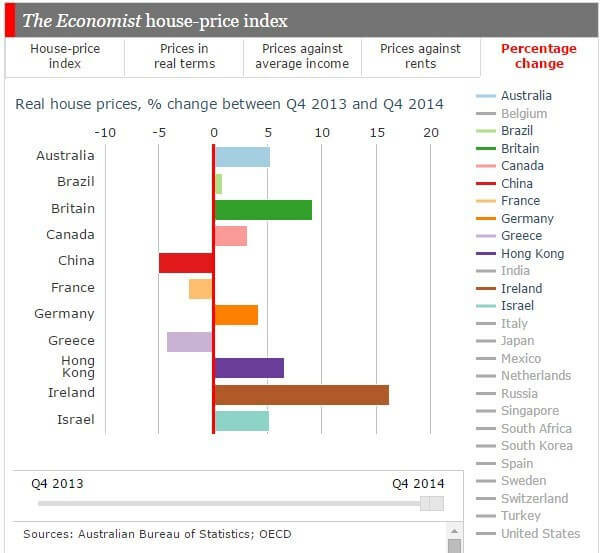 Strong city capital markets are the most misleading factors in global housing markets. A powerful market can easily stifle averages from the rest of the nation. Global housing markets rise and fall with demand and supply, like any other commodity on the market. Those planning a career in real estate, or simply looking for a long-term house, need to narrow their research to their locality. On second look, the market might not be as strong as it seems, or it might be stronger. Although global trends are upward at the moment, considering one’s specific location is a better indicator of how the market is moving. Global stock market returns – which markets give the best returns? Is There Really A Housing Crisis In The UK? Question 9 – Can I Move Out From Home?